With the advent of spring on Monday, March 20th, many of us begin that annual ritual of the season, spring cleaning. The EGT recommends that as you go through the unwanted stuff in your home that you consider the 3Rs of the recycling mantra when you make your decisions regarding their disposal. From clothes, to furniture, to old non-working or outdated electronics, to bottles of cleaners, pesticides, oil-based paints, driveway sealer, insect repellents, to reams of unwanted sensitive documents, these all may need to go. 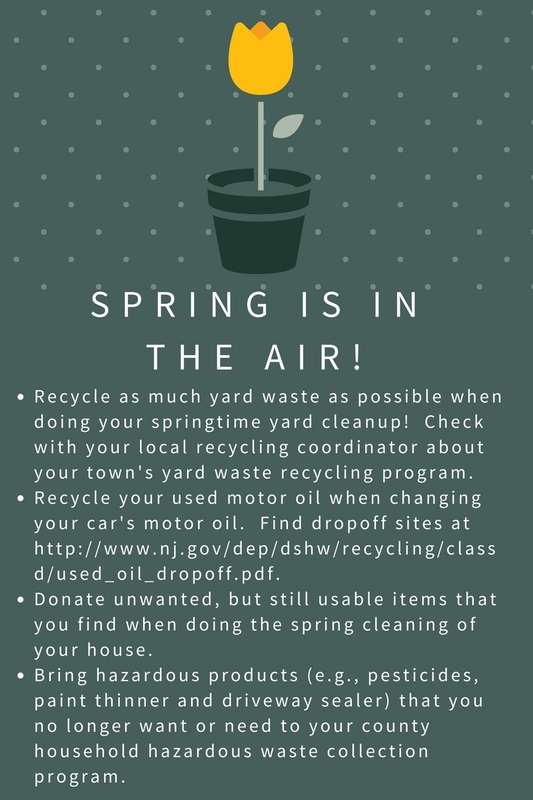 Fortunately, there are some specialized programs that are run in Ewing and Mercer County in April to allow you to dispose of many items AND there are many organizations that will take your gently used, no longer needed items and give them a new home. Before you make the decision to buy new we encourage you to reflect on whether you really need something new or whether cleaning or repair of the old item will do. For example, what about that pair of shoes with worn down heels that you love? Don’t throw them out. Take them to be repaired. There a wonderful cobber in Pennington who will make them look like new. Is your coat zipper broken? If the coat is in good condition otherwise, take it to a local tailor for repair. Spring is also the season for yard sales. Run one to find homes for clothes, toys, appliances, and books that you no longer need. Or, check out the local donation centers in Ewing and the surrounding areas at our sister website, EwingRecycles.org. Check out each to see which works best for what you want to donate. Don’t forget Easel, behind the municipal building, will taker unwearable clothes, sheets and towels for pet bedding. Dispose of sensitive documents safely and securely at Ewing’s first Shred Day of the year at the municipal building. Document shredding will be done on site. This service is for Ewing residents only and proof of residency is required. April 29, 2017 at the Pennington Road Fire Company, 1660 Pennington Road, Ewing, Times to be announced. Dispose of your unused medications safely and responsibly. Don’t forget Ewing’s Convenience Centers. Ewing Township has two waste Drop Off Convenience Sites for residential use only (with proof of Ewing residency). Check http://ewingnj.org/Departments/Public-Works/Brush-Bulk-Waste.aspx for hours. Construction debris, doors and windows, lumber, sheetrock, rugs, broken furniture, small appliances, missed garbage pick up and electronics recycling and more.